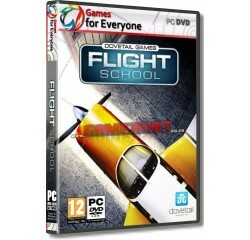 Flight School - 2 Disk - R160,00 : Game Hunt, Where we lead, others follow. Two high performance training aircraft: Piper PA-18 Super Cub and Piper PA-28 Cherokee. A unique pilot profile which keeps track of your progress. 15 fun and immersive lessons covering the basics of the LAPL, PPL, and night flying. Free Flight mode, so you can try out your newfound skills anywhere in the world. Processor - 2.5 GHz Dual Core® or equivalent AMD® processor.